Unlike Chengdu Taste, the menu is sparse, making it much easier to decide what to order. Plus, while the interior is pretty nicely designed for San Gabriel, the prices don’t reflect any sort of pretentiousness or fanciness, with literally every dish coming in below the $9.99 price point. I ended up ordering the Chengdu ZaJiang Noodles. This is essentially a noodle bowl (but not soup) dish filled with thin handmade noodles, a fried egg, minced pork and, for some inexplicable reason, bok choy. 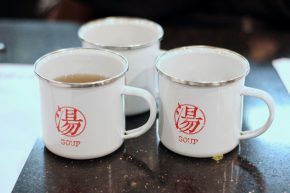 Each noodle dish also came with a corresponding mug with the word “soup” in both English and Chinese on it, which did have an explicable reason. The waiter explained that it was water used to boil the noodles and that some people liked to sip on it on the side while eating such noodles. It was cold, and tasted like water with a few sprinkles of sugar and starch. Not exactly my thing, but the noodles certainly were. The ZaJiang noodles managed to surpass any expectations I may have had before getting my food. 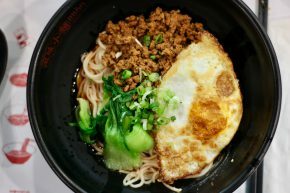 Not only was there a perfect balance of meat, egg and noodles – the spices used in my noodle bowl were impressively tart and spicy at the same time. 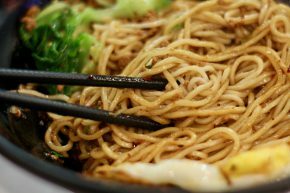 And when I say spicy, I don’t just mean traditional heat, I also mean Sichuan numbing pepper heat, which can often be overwhelming, but was utilized perfectly in these noodles. As far as flavors go, Mian is pretty unbeatable. As for the noodles themselves, I am generally more partial to thick noodles when they don’t reside inside of a soup, but Mian figure out how to make these work. Perhaps that is the greatest testament to how good Mian actually is. Just go, and you don’t even have to thank me later.